Ideal for Labeling, Arts & Crafts, and Painting. Can be written or painted over crepe paper adhesive tape. Excellent choice for arts, stationaries, labeling, kid’s school projects, and other crafty activities. Mult-uses! Adhesive adheres well to a variety of clean, dry surfaces and works well as painters tape. 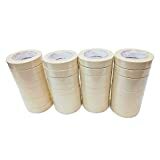 Additionally, surfaces such as cloth, leather, plastic, paper, laminates, and metal work well with this tape. Residue Free – applies easily and removes without leaving residue. Tears easily by hand without curling while being sturdy enough to do the job. Quality writable crepe paper adhesive is perfect for home and office use.